A few weeks ago, my husband Brendan was diagnosed with diabetes. He’d been experiencing some unexplained symptoms starting in early February (waking up with dry mouth and excessive thirst/craving for sweet drinks, mostly). On February 22nd, after a particularly carb-heavy dinner, he was feeling a little off. This lead him to do a little googling, and he quickly put it all together. A slew of doctor appointments that week resulted in a diagnosis of Type 1 diabetes, the autoimmune form of the disease that requires management with both long-acting and short-acting insulin. We knew it wouldn’t make a lot of sense for it to be Type 2, since Brendan’s a slim, active guy with a balanced diet. Still, neither of us had ever heard of someone being diagnosed with Type 1 as an adult. As it turns out, it’s not unheard of. People who are genetically predisposed to diabetes can live without the disease until something triggers their immune system to set it in motion in adulthood. This form of Type 1 diabetes is informally referred to as LADA, or Type 1.5. Dinnertime has changed pretty drastically in the last few weeks. Brendan has to determine the carb count of every meal beforehand, in order to dose himself with the appropriate amount of short-acting insulin. As the main cook in our little family unit, this means I have to keep the nutritional content of our dinners in mind as I’m putting them together. So far, we’ve found that the easiest way to keep Brendan’s blood sugars from spiking too much is to eat fairly low-carb. 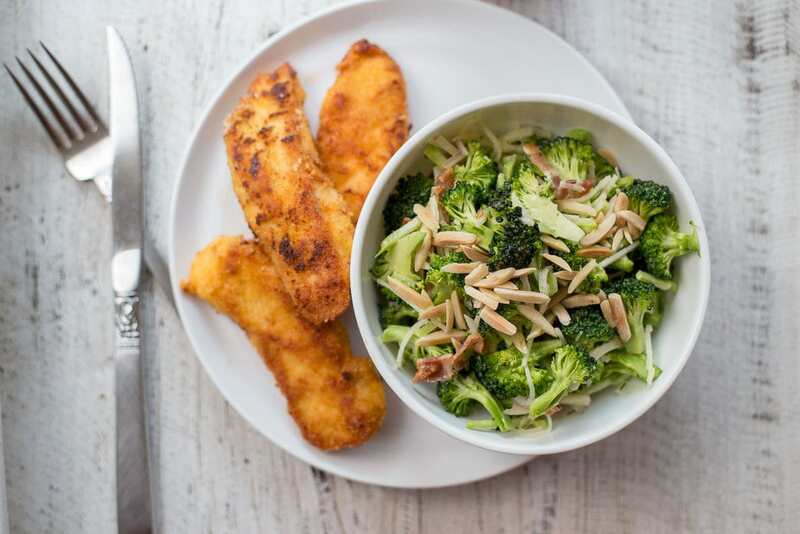 Well-balanced meals that are based on lots of non-starchy vegetables, a good amount of protein, and a healthy dose of good fats are easiest to manage. 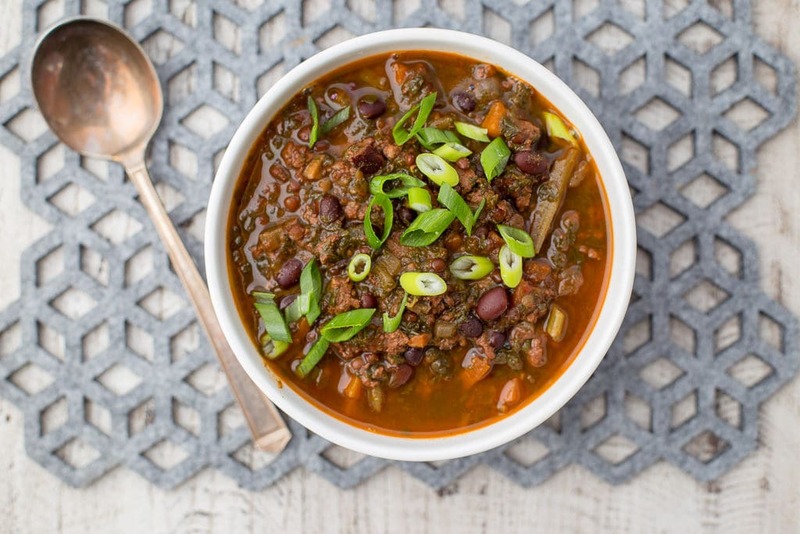 While I’ve always preferred to cook recipes with mostly unprocessed, nutrient-dense foods (case in point, the recipes on this blog), I’ve never had to be so mindful of carb counts. I’m used to thickening sauces with a little cornstarch, adding a scoop of breadcrumbs to meatloaf and meatballs, a teaspoon of sugar to vinaigrettes and marinades, using fruit juice as the cooking liquid in Instant Pot braises … it’s easy to end up sneaking more carbs into a meal than you’d think. We’ve also learned to enjoy different kinds of indulgences. The warm, savory comfort of a mug of bone broth before dinner is a new one, and it’s especially nice in cold weather. We’ve made our way through the roasted turkey broth that was in the freezer, so yesterday, I made a similar chicken-based version. I used necks and backs bought from Dittmer’s, one of my favorite local butcher shops. 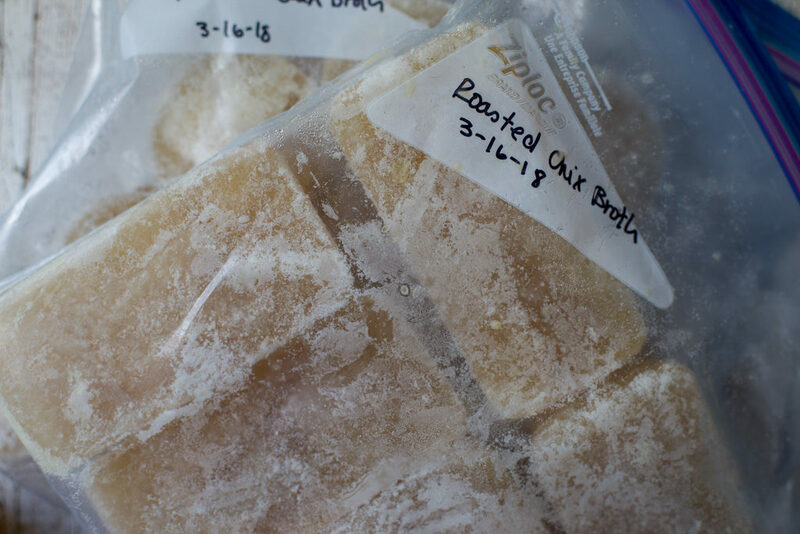 These are my favorite chicken parts for making broth, since they release lots of gelatin as they cook, adding body to the broth. You can certainly just throw everything in the Instant Pot, press a button, and walk away. For a really special broth, though, I like to either sear the chicken parts first, or even better, give them a quick roast in a hot oven along with some aromatic vegetables. The chicken, carrots, parsnips, and onions take on a golden brown color, which makes the stock look extra appealing, too. You can serve this bone broth as is, add a pinch of salt for extra seasoning, or for a spicy, sinus-clearing version, add a spoonful of sambal oelek (chili paste) to each mug. 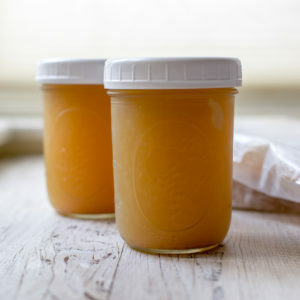 Bone broth also makes a great cooking ingredient, adding depth to soups, stews, and braises. Store it in the fridge for a few days, or in the freezer, for a few months. However you enjoy it, I hope it adds nourishment and comfort to your meals, as it has to ours. Roasted chicken and vegetables make a golden broth, perfect for sipping or cooking. Preheat the oven to 425ºF and line a sheet pan with a silicone mat or aluminum foil. Place the chicken parts on the lined sheet pan, skin side down. Sprinkle the chicken with half of the salt and pepper, turn the pieces over so they’re skin side up, and sprinkle with remaining salt and pepper. Arrange the carrot, parsnip, and onion around the chicken. Bake for about 30 minutes, until the chicken is golden brown and the vegetables are browning around the edges. Use tongs to transfer the chicken, carrot, parsnip, and onion to the Instant Pot. I also like to scrape in as much of the fat and browned bits as possible from the pan — a thin, flexible nylon spatula is great for this. Add water and bay leaves, making sure not to fill the pot more than 2/3rds full. Let the pressure release naturally for at least 1 hour (it’ll take about 1 hour 15 minutes to release completely on its own). You can also leave it on the Keep Warm setting for up to 10 hours. Working in batches, ladle the broth through a strainer into a fat separator. You’ll need to let the broth cool to room temperature before storing. I like to speed up this process by pouring the broth from the fat separator into a big stainless steel bowl, with an even bigger bowl or sink full of ice water underneath. Either way, I do the whole operation in the sink for easy clean-up. The broth cools down in minutes, and then you can ladle it into storage containers and put them in the fridge or freezer right away. Reserve the chicken fat (schmaltz) for another use, if you like. Discard the leftover vegetables and chicken parts -- they will have given up most of their flavor to the broth. 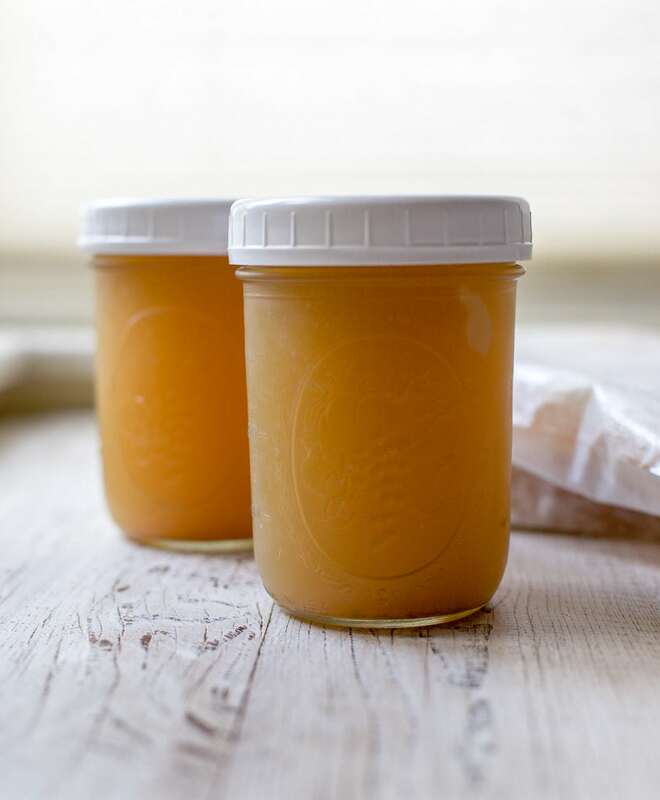 Store the broth in mason jars in the fridge for a few days, or ladle it into silicone mini muffin or mini loaf pans, freeze solid, then pop out of the molds and into freezer bags, and store for up to 6 months. 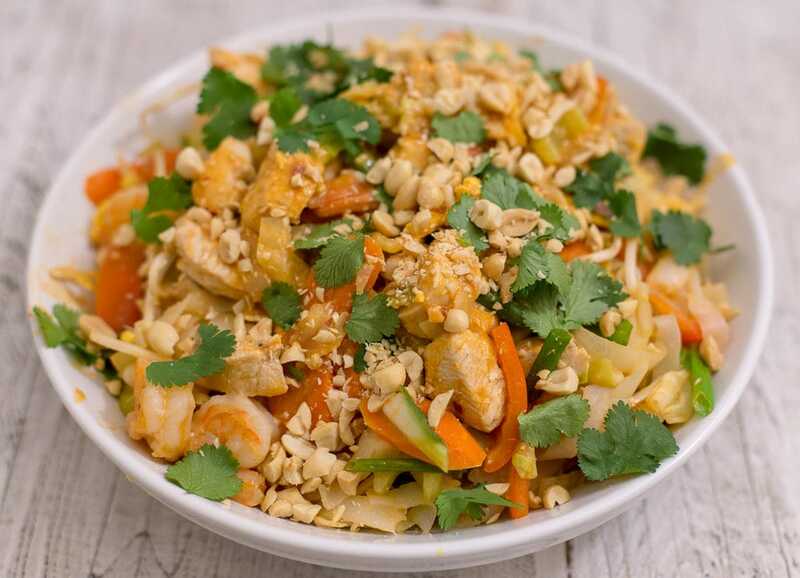 Do you have the recipe for Miracle Noodle Pad Thai? I’ll be posting that one next week! ???? I just shared it — you’ll find it on the blog now! ???? Question, has anyone considered asking your local butcher to save the necks and backs and then freezing them to use for broth? Thank you for the recipe. I can’t wait to make it. With the new IP coming out that also cans, I’m looking forward to canning small batches as I make them. You know, that’s what they do at Dittmer’s. They just make up bags of necks and backs and keep them in their freezer, then put a few out in the refrigerator case for sale each day. They only have them available when the butcher happens to have been cutting up chickens, but luckily that’s most of the time! Do you think I can add chicken feet to the chicken & vegetables when I roast them? Thanks Coco….I am looking forward to making this. I wasn’t sure if I could roast the chicken feet…never did that before…I know I can add them to the bone broth. I will give it a try. My husband freaks out whenever he see them!